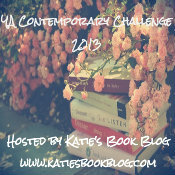 2013 YA Contemporary Reading Challenge ~ Love.Life.Read. I love, love, love contemporary YA fiction! I think with the dystopia and paranormal crazes, contemporary fiction sometimes seems blah but that is so NOT TRUE. For me, reading about situations that YOU could actually experience today just gives the book a whole another dimension. I do appreciate dystopia fiction too but I have a soft spot in my heart for contemporary fiction.